What a cool site and great idea! I Found Your Camera is dedicated to reuniting folks with their lost cameras and photos. How cool is that? I have been doing some serious gavel slammin’ on the family tree trying to get all these folks un-divorced and un-remarried. There are also some side family lines with small numbers that I have taken care of but they are too many to list. I’ll keep you all updated on the progress. Don’t get too close…you just might get nailed!! Not-Me & I watched the best movie last night. If you haven’t seen August Rush yet, don’t waste any more time. Go get it right now and watch it tonight. You will not be disappointed. Not-Me wanted to give it 5½ bones but that would put it off the charts. Let’s just say, if The Bone had an extra ½ of a bone, this movie would get it…hands down! and divorce them all in 1987. 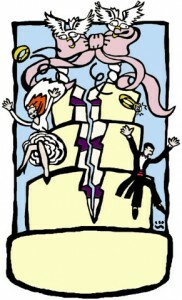 Then it decided to remarry them all on April 17th, 1992. Seriously. I’m not kidding. It didn’t even matter if they had already been dead for 150 years. They got divorced in 1987 and remarried on April 17, 1992. Sooooo, guess what I’ve been doing ever since I discovered the wonder of the fantastic, all encompassing, impressive beyond belief Roots Magic…Yep!! I have pretty much become a “one stop has it all” Justice of the Peace! Anybody seen my sanity lately??? 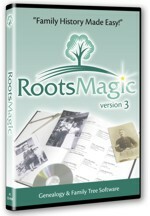 After so much fruitless effort with FTM and my blood pressure reaching stroke status, my research pointed me towards the preferred program among genealogists today…wait for it…Ladies & Gentlemen, fellow Bone Collectors, I give you the power of Roots Magic! This fabulous piece of awesomeness did it! It not only imports files directly from FTM but it opened this heretofore damaged and unusable supposedly lost forever file! I shall sing its graces until the end of time. Due to whatever chaos erupted in the FTM file, there are some inconsistencies I now have to clean up before I will be ready to repost anything but, rest assured, everyone is present and accounted for…thank God. I finally was able to get some sleep last night. Thanks to Mark and Lee for your suggestions and offers of help and to Jill for your constant support. WeMightBeKin is in massive meltdown and I am on the verge of a stroke! My Family Tree Maker program crashed, crumbled, obliterated itself, I don’t know what it did but whatever it was it decided to take the WeMightBeKin database with it…all 48MB’s of it. I have been in contact with FTM gurus trying to rescue our precious research and pulling out every trick in the book that I know of but nothing has worked yet. Please keep your fingers crossed and say about 452 prayers. I’m scared. It is absolutely eye-opening when you realize that you are never going to get there. Never. You have spent your entire life trying to reach that point of acceptance when, finally, you realize that it just isn’t going to happen. The people you want it from the most are never going to give it to you. So why is it that you keep trying? Why is it that you keep running headlong into the same briar patch knowing that the pain is going to be the same in the end? When push comes to shove, you will be the one shoved. If someone is going to be given the benefit of the doubt, it will not be you. You are dispensable, expendable, not necessary, inconsequential, unimportant, insignificant…and now you know it without any hesitation or uncertainty. It has been blatantly proven too many times to be ignored any longer. What is most mind-boggling is the fact that the self-same people who will not grant you the approval you so desperately long for actually fought this very battle themselves…also to no avail. One would think they would understand the misery and unhappiness such a station in life produces and not be willing to pass it along. Then again, you live what you learn and you learn what you live. The lesson was well taught. Saw the movie Taken last night. Wasn’t too impressed really. I am a Liam Neeson fan. Always have been. But he just didn’t really do it for me in this movie. It started r e a l l y slow and when it finally got moving it was extremely chaotic at points. I guess with all the hype and the previews I was just expecting better than I saw. Maybe it’s just me. Maybe not. Anyway, The Bone gives it a mere 3 out of 5 bones. Sorry Liam. Now, I saw Gran Torino last week and that was an awesome movie…Clint Eastwood in all his glory! You do have to watch it with an open mind though and not be easily offended as he is most definitely offensive to EVERYONE. Totally enjoyed that one and the ending took me by surprise. The Bone says this one is a “must see” and gives it 4.5 out of 5 bones. In a move that has angered the Apostrophe Protection Society, the English city of Birmingham has decided to remove the apostrophe from its street signs. BREAKING NEWS: There is an Apostrophe Protection Society! This is a shot of the front page of the online edition of our paper from this afternoon. Notice the area I have circled in yellow? Let me help you. It says, “2:08pm – Porttsmouth hatching slaying case heading to grand jury”. Um huh. First of all, the city is Portsmouth, as in the mouth of the port. Only one “t” needed really. Secondly, it was a “hatchet” slaying case. Portsmouth (one “t” or two) really wasn’t hatching a slaying case at all see? Nor were they heading to the grand jury apparently to off them all. Yeah, I’ve never been impressed with newspapers much at all and ours has just added another nail to its coffin. Bad paper. Bad, bad paper. You are currently browsing the bonecollector weblog archives for February, 2009.